If all goes according to plan, the Russell Library will begin moving its collections to the Special Collections Building on Hull Street on Tuesday, September 6, 2011. 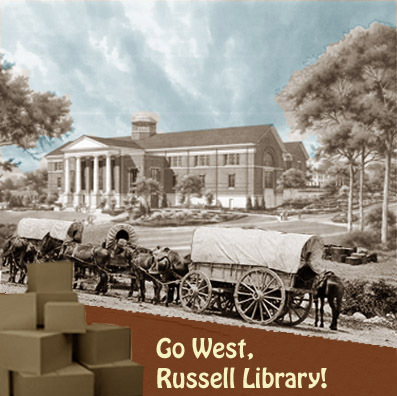 The Russell Library will remain open for research at its current location through September 2, 2011. Until September 6, 2011, visitors to the Russell Library should use the main entrance of the Main Library building and alert the representatives at the security desk that they need to have access to the Russell Library. Once the move begins on September 6, the Russell Library will close for all research until early November. The Special Collections Libraries Building will reopen to the public with normal service in January 2012. PLEASE NOTE: ALL DATES ARE SUBJECT TO CHANGE BASED UPON CONSTRUCTION AND MOVE TIMETABLES. Please direct questions related to accessing Russell Collections during the fall semester to Jill Severn (706-542-5766 or jsevern@uga.edu). Russell Library Blog: http://rbrl.blogspot.com, Topic of Discussion "On the Move"